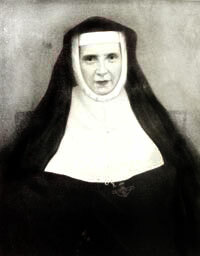 Loreto in India owes its origin to a visit by Dr. Bakhaus to Loreto Abbey, Ireland, in 1840 to request Mother Teresa Ball to send sisters to set up a school for Catholic children in Calcutta. In 1841, Mother Teresa Ball sent seven Loreto Sisters and five Postulants, all in their twenties, under the leadership of Delphine Hart to India, announcing that they would probably never see their homeland again. They were welcomed at Calcutta by Bishop Carew, and installed at Loreto House, 7 Middleton Row. They were the first congregation of Sisters to come to North India.